SEOUL, Nov. 23 (Yonhap) — SK Group head Chey Tae-won on Friday decided to hand over a 4.68 percent stake of the group’s holding company to his relatives. The holding firm, SK Holdings Co., said in its regulatory filing that the move involves 3.29 million shares changing hands. 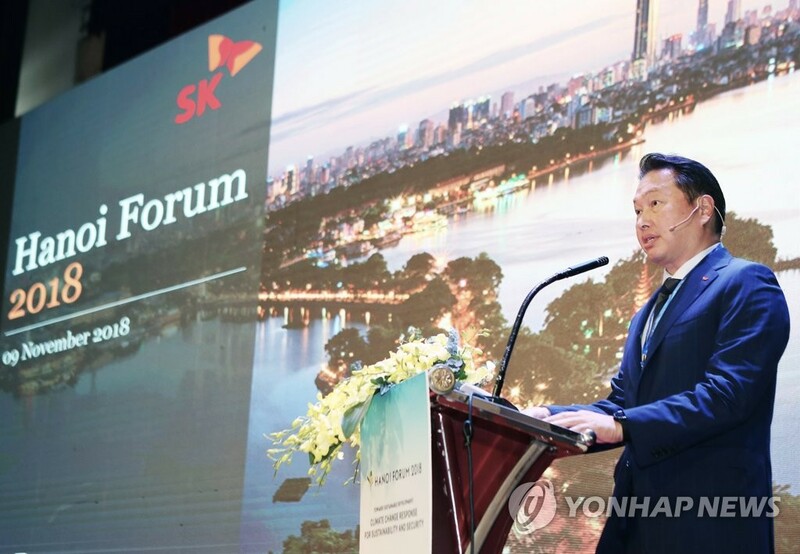 Of the stakes, Chey’s younger brother Jae-won received 1.66 million units, followed by the family of the late Choi Yoon-won, who headed SK Chemicals, with around 490,000 units. The group chairman also gave 830,000 shares to SK Networks Chairman Choi Shin-won and his family. SK Group said the move will not affect the existing governance structure of the conglomerate. The combined value of shares that will be gifted through the move is estimated at 960 billion won (US$848 million). Following the decision, Chey’s stake in SK Holdings decreased to 18.72 percent from the previous 23.4 percent. SK Group said Chey made the decision to express gratitude to his relatives for their support in the corporate management.